Step up to the beat when you strap this ultra-lightweight Bolt Armband for iPod Touch 2G from Contour Design on to your arm for your next workout or jog around the block!. 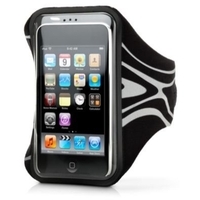 Designed with the iPod Touch 2G in mind, this lycra and spandex Bolt Armband has a contoured fit for close-fitting comfort. A sweat-resistant strap won't slide about your arm, no matter how sweaty you get. So it's perfect for jogging and any other sporting pursuit which would benefit from the musical accompaniment of your iTunes. And you needn't worry about how mucky your outdoor activities get: the Bolt Armband is machine washable.